I've been meaning to write an entry but at the moment I can't think what it was I was going to write about. I'm sure it will come back to me. At the moment all I can think about is that I feel kind of crappy. At least they have finally stopped doing whatever work they were doing down the hall that was making a sound like a very large and very annoyed bee. It went on about half an hour and it definitely contributed to the current headache. However, there has been consumption of Aleve and Allegra-D in the interim and hopefully they will kick in soon. So enough about that. This is made almost entirely out of leftovers from the bigger quilt (with a few leftovers from the zipper quilt thrown in for good measure). The only "new" fabric is the background fabric - of which there are two. I ran out, so I borrowed some from my mother. They alternate between one block and the next, although they're so similar you can't tell it unless you look extremely closely anyway. 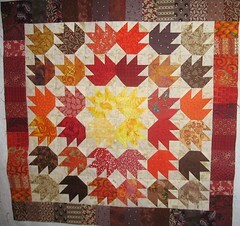 The borders are also something I made for the first leaf quilt and didn't use. They were much wider, and I cut them in half lengthwise and used them on opposite sides. I'm really happy with it, on the whole. Hmm, I'm inclined to think this isn't too far off the mark, although I think it might skew me more toward the right than is actually the case - on a lot of those either-or questions, I really wanted to say "a little of both."